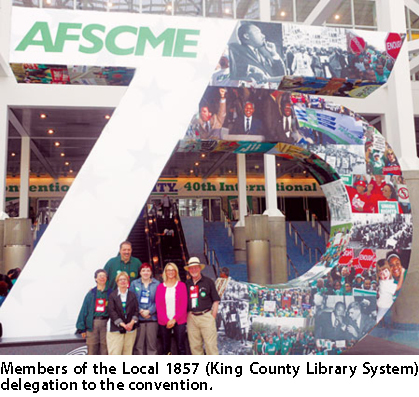 About 200 Council 2 members attended the 40th International AFSCME Convention in Los Angeles in late June. They were among 5,000 delegates from around the country who adopted key policy resolutions and constitutional amendments during the week-long convention. They also took part in a rally during the convention at MacArthur Park expressing solidarity with California sisters and brothers fighting cuts to public services statewide and kicking off negotiations with the University of California system. 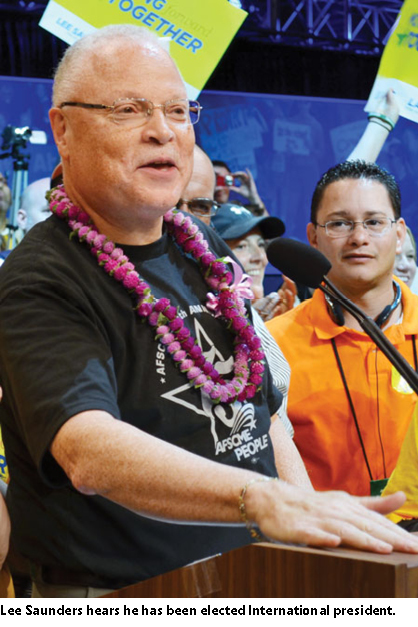 During the convention Lee Saunders — chosen as secretary-treasurer at the 39th International Convention in July 2010 — was elected president, replacing Gerald McEntee, who retired after leading the union for 31 years. Laura Reyes was elected Secretary-Treasurer, the first woman to hold this position. “It was a very well attended and exciting convention, with the election of Lee Saunders a highlight,” says Council 2 President/Executive Director Chris Dugovich. Saunders told the convention that members “must work our hearts out to re-elect President Obama” to meet the tough challenges facing labor and working families” and that the union will hold all politicians accountable for their treatment of public workers. “We must continue the focus on organizing, even in hostile, right-to-work states, because we cannot win the fights of tomorrow unless we are growing today,” Saunders said. “We must propose long-term solutions to strengthen pensions, emphasizing that most of our members pay into their pensions, and that those pensions contribute to local economies. In her address, Reyes focused on building a stronger union. “We will dig deep into every state, every city to organize new workers from every sector,” Reyes said. Read also: Saunders is great choice for International President.